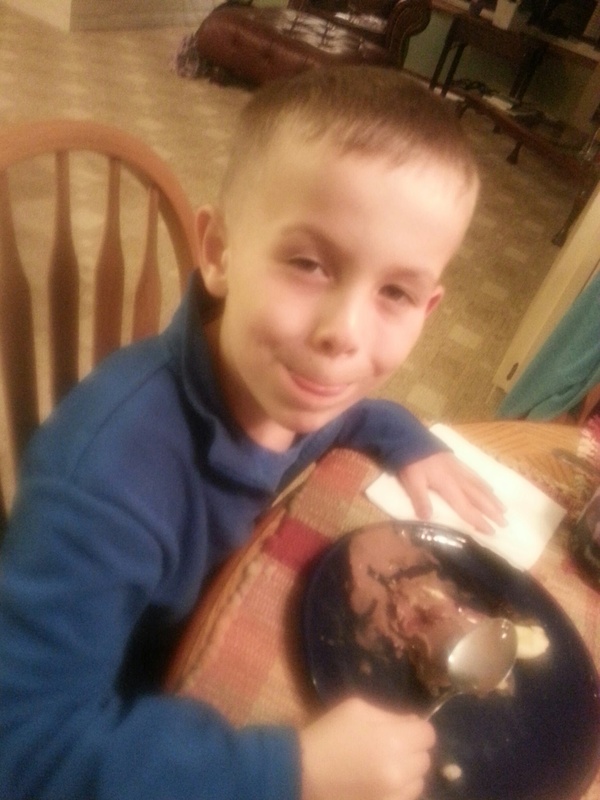 Cooking With Nana | Messes. Laughter. Memories. At least that is what my grandkids would call them. 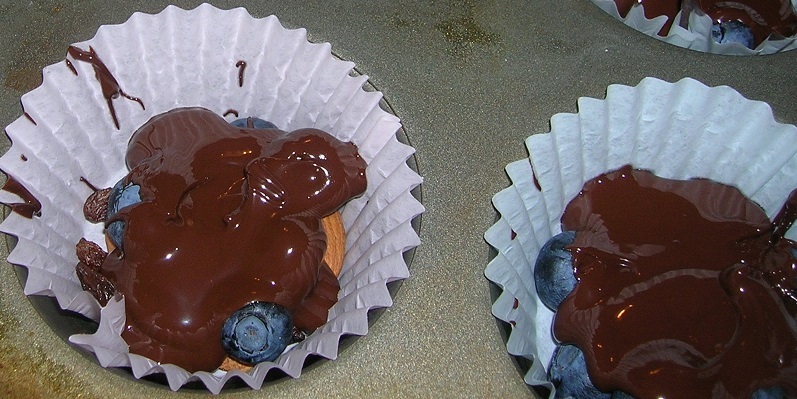 These yummy treats are easy to make, and very good….and, amazingly, good for you! There is a simple ingredients list with a lot of options. No baking necessary! Line a muffin tin with cupcake papers. Dry roast nuts in a skillet until fragrant – 3-5 minutes, remove from heat and allow to cool. Sprinkle cooled nuts, dried fruit and blueberries into muffin cups about half way up. Spoon 2 T (about 2 oz.) dark chocolate over each fruit and nut cup and allow to harden. At the last minute, sprinkle flaked sea salt on top. Let cool completely before removing from cups. Makes 12. Watch out! These will go fast! This entry was posted in Uncategorized and tagged anti-oxidants, blueberries, candy, dark chocolate, dried fruit, easy to make, family friendly, gluten free, good for you, kid friendly, nuts on January 21, 2014 by cookingwnana. The grandkids and a friend, Delaney, came over this week to help me pick apples. My tree was loaded this year, and It took all of us with the ladder to get about 50 lbs of apples! 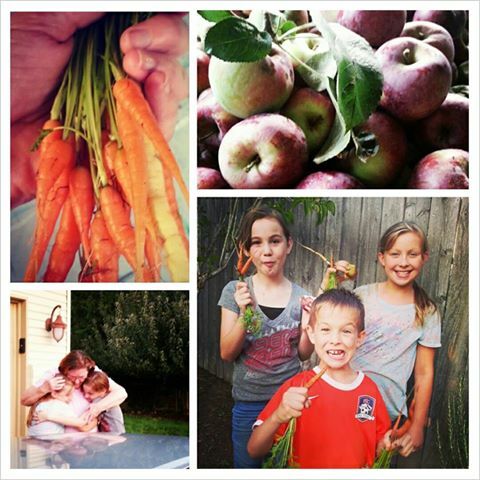 (and a few of Cooper’s favorites – carrots!) The apples in the top of the tree (which I failed to prune last year) will fall eventually and then the deer will be happy once more! (in the case of the all organic apples) and biting around the bird pecks and the deer bites…everyone got a taste of goodness! 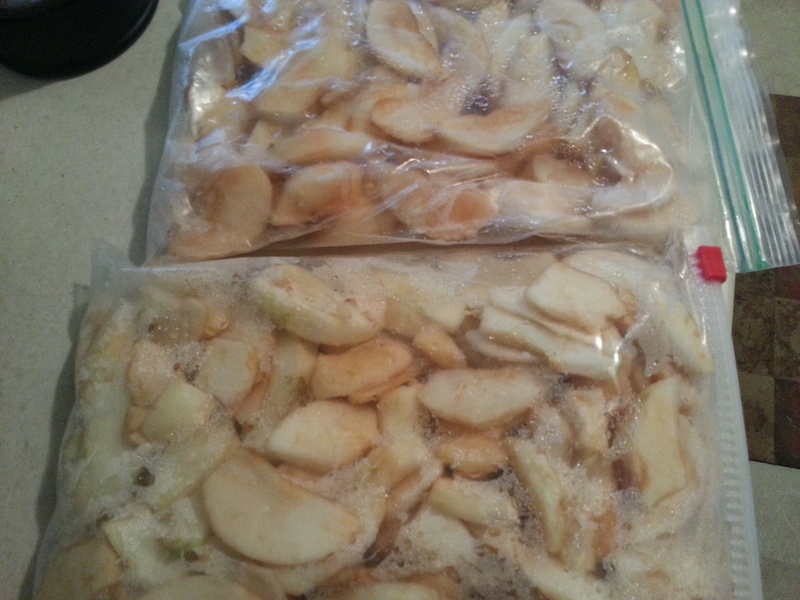 Now the chore of peeling, coring, slicing and packaging these beauties for the freezer, and some fresh apply treats….apple pie, apple crisp, applesauce, apple fritters, etc. I know! APPLE PANDOWDY! The kids had never heard that term, and I was curious too, so I looked it up! When I was growing up, my mom’s favorite TV show was the Dinah Shore Show…many of you weren’t born yet, so you won’t remember, but she made one song famous that we sang around the house “Shoe Fly Pie and Apple Pandowdy”. I grew up wondering what those enticing sounding foods were made of besides the obvious – apples…but probably not flies…eouwwwww! Well now that I’m writing food blog and humming the song once again…I did a bit of research! Shoe Fly Pie has it’s roots in the South and can be anything from caramel based pie to a kind of pie that has a soft gooey center like Pecan Pie…just without the pecans! That sort of makes my teeth hurt just thinking about it. *All kinds of optional fruit can be added like: raisins, rhubarb, raspberries, cranberries, etc. to be included in the 6 cups. Make crust: In a food processor, pulse flour, sugar, and salt until combined. Add butter; pulse until mixture resembles coarse meal with a few pea-size pieces of butter remaining. Sprinkle with 2 tablespoons ice water. 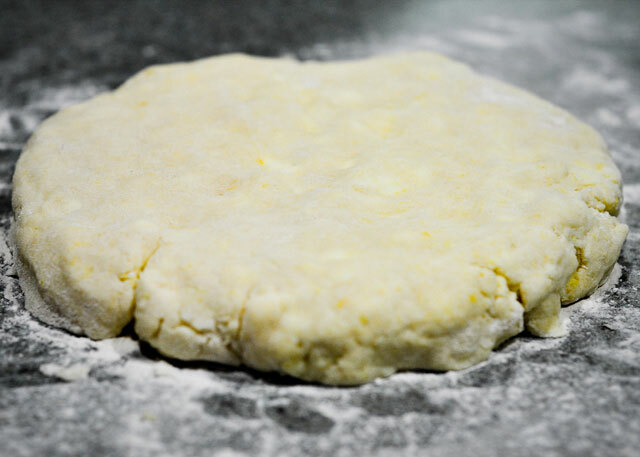 Pulse until dough is crumbly, but holds together when squeezed (if necessary, add 1 tablespoon more ice water). Do not overmix. Form dough into a 1-inch thick disk, wrap tightly in plastic, and refrigerate until firm. Mix sugar, lemon, flour, salt and spices together and mix liberally with fruit. Place the fruit mixture in the bottom of a deep dish. Allow apple mixture to macerate for 15 minutes. Dot with butter over the surface of the apples. Roll out dough and cut into uneven strips. Place dough strips at various angles across the top of the pie leaving a few holes for filling to bubble through and brush with cream. (This is the dowdying part). Sprinkle coarse sugar over crust and bake at 350 for about 50 minutes or until the top of the crust is browned and apples are bubbly. Serve with a dollop of unsweetened whipped cream or vanilla ice cream. Hope you enjoy this down-home treat! This entry was posted in Food, Grandparenting, Kid Food, Uncategorized and tagged apples, comfort food, cooking with spices, Easy to Cook, eating healthy food, fresh food, kid friendly food, organic, pandowdy, pie on September 19, 2013 by cookingwnana. My neighbor and organic gardener friend, Lucy, brought me some beautiful pluots last week. 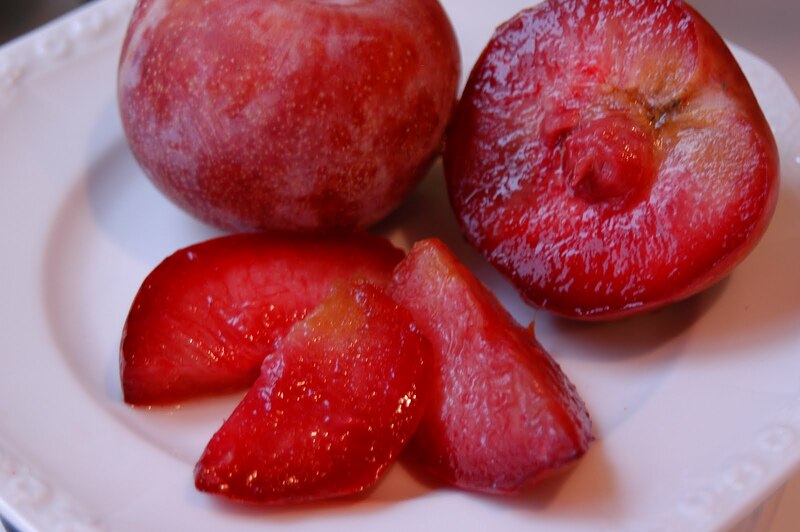 I never tasted this pink fleshed sweet-tart fruit (pluot – plum/apricot) until I lived in the Pacific Northwest. She brought grafts from her trees in California when she moved up here and this is the first season they have fruited in abundance. Seems like everything up here in the Pacific Northwest is lush this summer! The next day, my other organic gardener and artist friend, Jackie brought me some figs and Italian Plums from her garden. I have also started picking some apples from my own trees, so I had an abundance of fruit on hand. 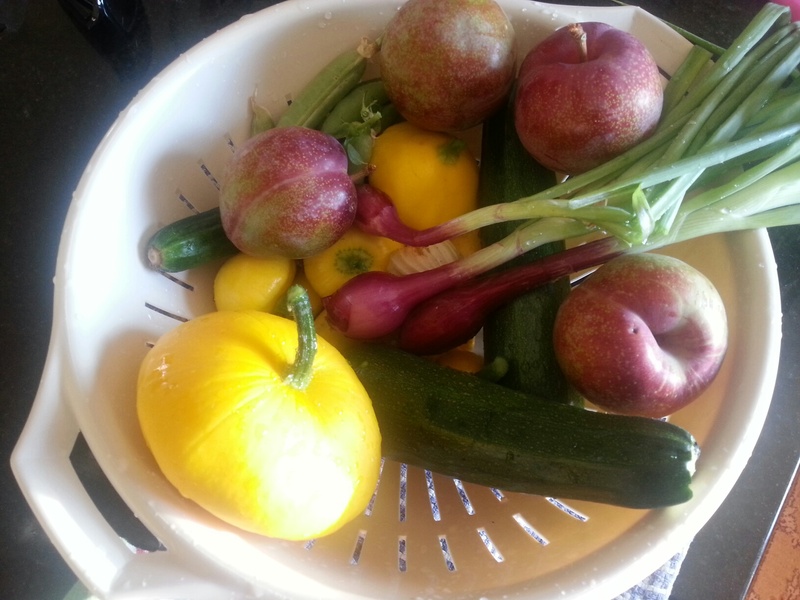 Once the fruit flies started circling…I knew I had better find a solution for all this fruit! 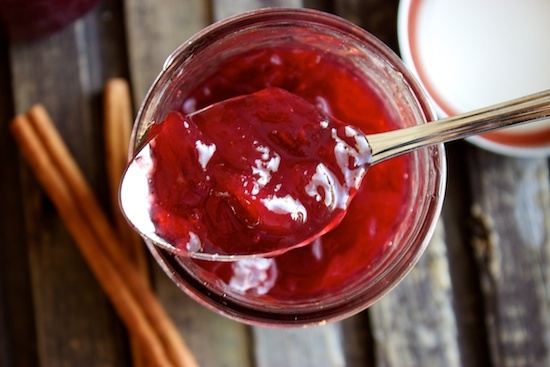 It was then I came across a lovely blog called The Savory Sweet Life and found a recipe for Plum Jam without using pectin. I don’t object to pectin, I just didn’t have any on hand. 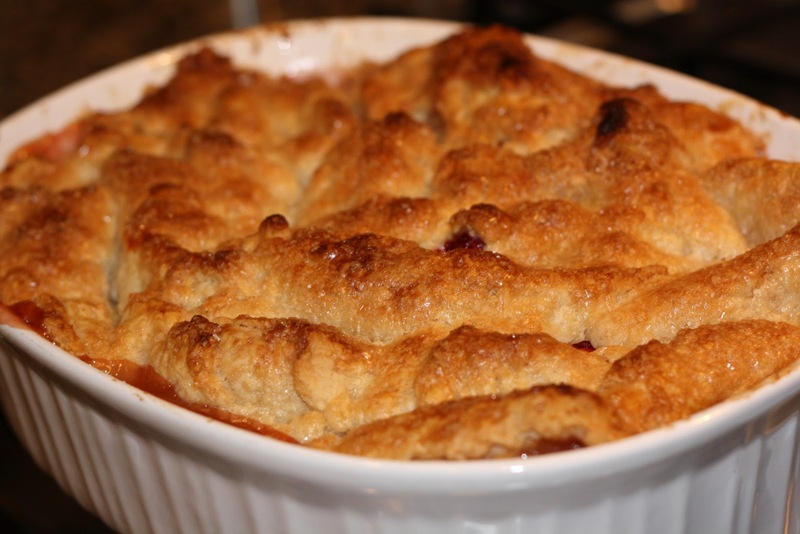 This was great…a 3 ingredient solution to my plum dilemma! Upon Googling further, I found another article about using figs in plum jam from What A Dish! This one also had no pectin in it! 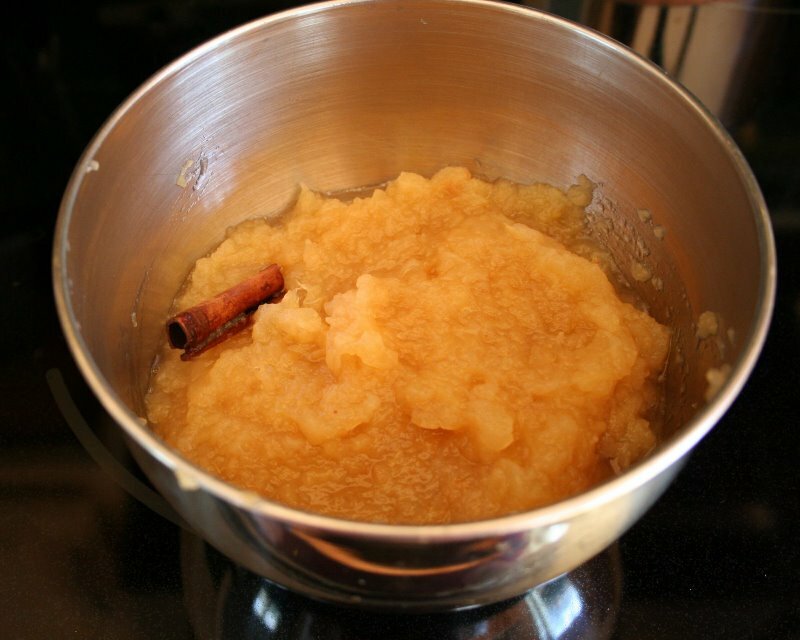 Yet another recipe told me that pureed cooked apples had enough pectin in them to substitute for the powdery stuff! I was in luck. Jumbling all these recipes together, I came up with Plum Wonderful….a spicy fig, apple, pluot, Italian Plum Jam to die for! Sooooo good. Try some! 2 apples, peeled, seeded, quartered and cooked. 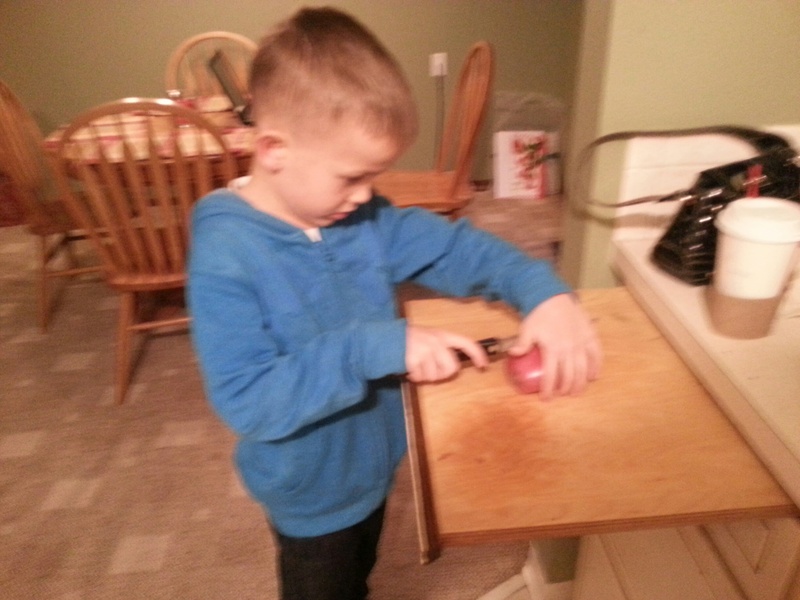 Then puree the apples in a food processor. 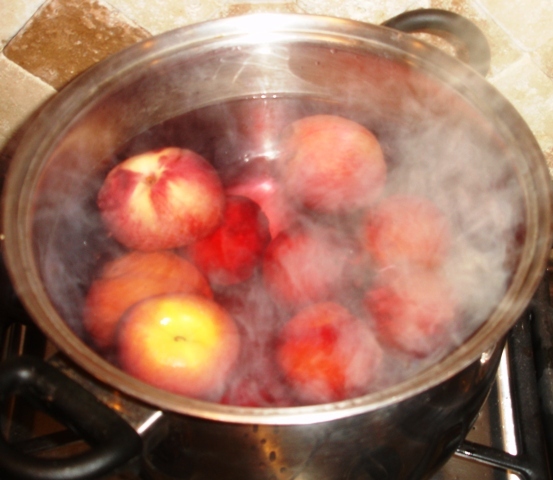 Dip plums, pluots, and figs (or any other stone fruit like apricots or peaches, any you like) into boiling hot water for 2 minutes, remove with slotted spoon and put into an ice bath until cooled (about 5 minutes). When cooled, peel and remove stones. The fruit will peel very easily. 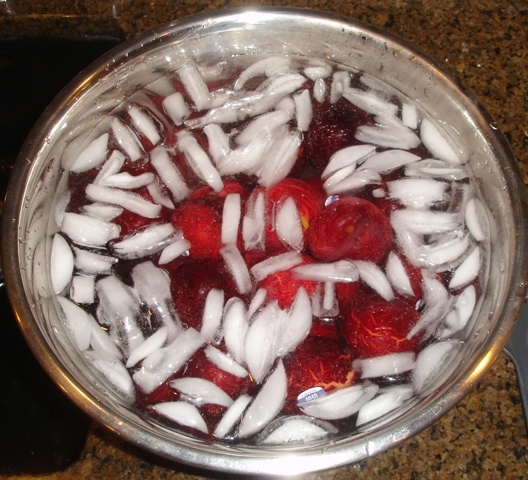 Dice peeled fruit to make 4 cups into sauce pan and simmer on medium heat until fruit starts to soften. I like my jam chunky, so I used a potato masher to break up the fruit into smaller chunks….but not smooth like applesauce. Leave chunky. Add: 1 cup sugar, 1 cup apple puree, 1 t. cinnamon, 1/2 t. ground ginger, 1/2 t. Allspice to pot and simmer on low until liquid is decreased and mixture is thickened. You can then add 2 T fresh lemon juice or freshly squeezed orange juice to mixture and simmer another 5 minutes. Cool and pour into jelly jars. Refrigerate when cool. Keeps in the refrigerator up to 2 months. Since the kids are out of town on a family vacation this week, I can’t wait til they get back and we can try this on our PB&Js. If they were here, they could help with dicing fruit, measuring ingredients, but probably not with the cooking….hot jam splashes really hurt! Just be careful to keep the temperature low and be careful when pouring it into the jars! Sweet, spicy, flavors of fall and the abundance of summer! Plum Wonderful! This entry was posted in Food, Grandparenting, Kid Food and tagged comfort food, cooking with spices, Easy to Cook, eating healthy food, Figs, healthy eating, Italian Plums, kid friendly food, no pectin recipes for jam, organic, plums, pluots, Prunes on August 28, 2013 by cookingwnana. What To Do With All Those Tomatoes! 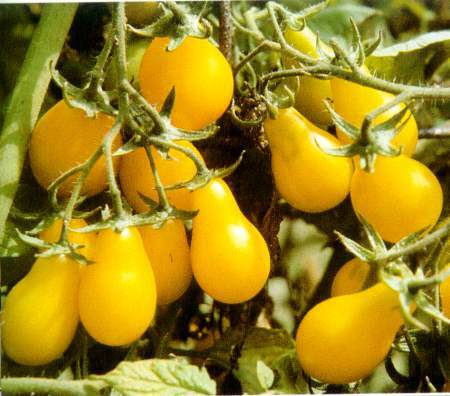 Besides eating them still warm from the sun with a bit of salt and pepper, tossing them into salads (I especially like the yellow pear tomatoes for that! 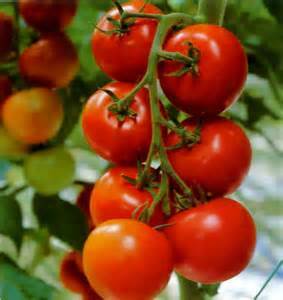 ), I also make them into spaghetti sauce and tomato paste. 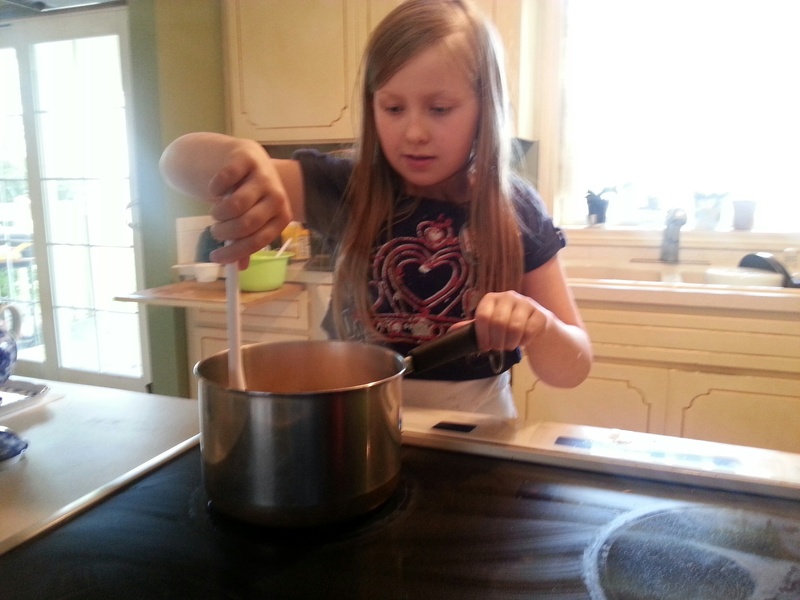 But this year, the gkids and I decided to try to make our own catsup, ketchup,…or however you say it or spell it! 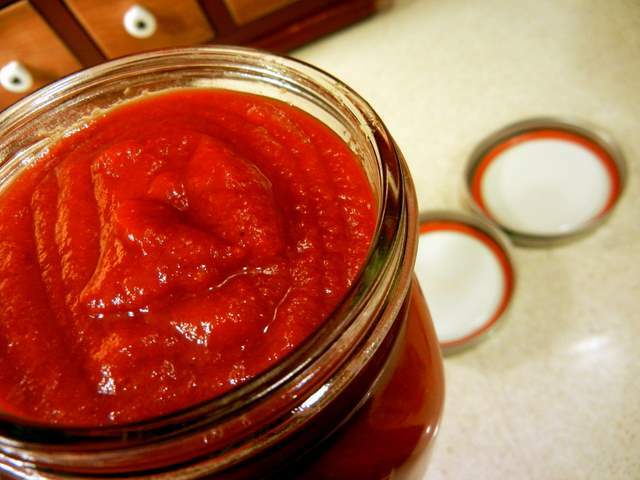 To make catsup you can start with tomato paste or make your own by cooking down your chopped tomatoes, adding a bit of onion, salt and pepper (perhaps a bit of oregano for an Italian flair!) and simmer them over medium heat until they have reduced by 1/2 – this takes a couple of hours on lowered heat. MMMM…very sweet and delicious all by itself! But today we are making catsup! 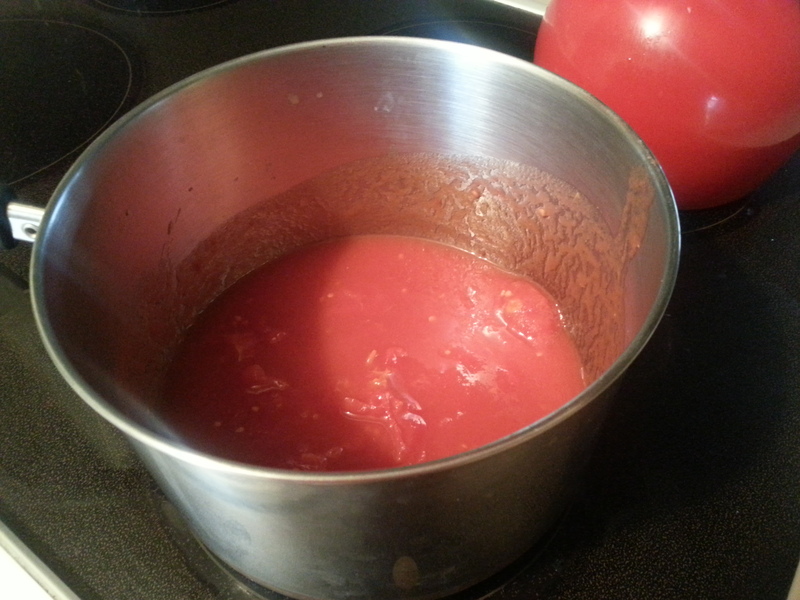 So after cooking the tomatoes down to half their volume, I put the cooled batch through a blender or food processor. 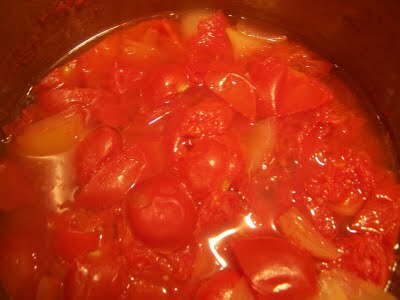 When I am making catsup, I use tomatoes that have been peeled (Dunk them in boiling water for 2 minutes and the skins will come right off!) Once the mixture has been blended, return the pureed mixture back to the pot and add in the spices. 4 lbs. of tomatoes, peeled and diced. Add salt and pepper, and Italian seasoning if you wish and cook down to 4 cups. (1/2 the original volume). Puree in food processor and return to pan. I like my Ketchup smoky…so I also add 1 tsp. ground cumin – this is optional. Cook and simmer together for about 45 minutes to 1 hour, to again reduce the mixture by half. The Ketchup should be thick and creamy. If they are lumps, cool and puree again. When mixture is completely cool, add to sterilized jars with tight fitting lids. Stores in the refrigerator for up 3 months. Now wouldn’t that taste good on a Summer Grilled Burger? Enjoy that taste of summer all year long! This entry was posted in Food, Grandparenting, Kid Food and tagged catsup, comfort food, Easy to Cook, eating healthy food, fresh food, Homemade Ketchup, kid friendly food, organic, tomato recipes, whole food on August 21, 2013 by cookingwnana. 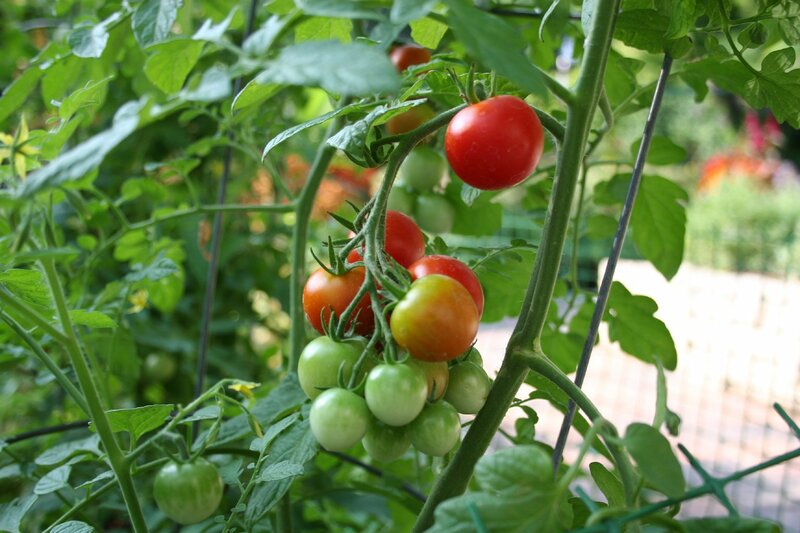 It’s that time of year….the garden is beginning to show its first fruits (and veggies) and everything is ripening in the sun! 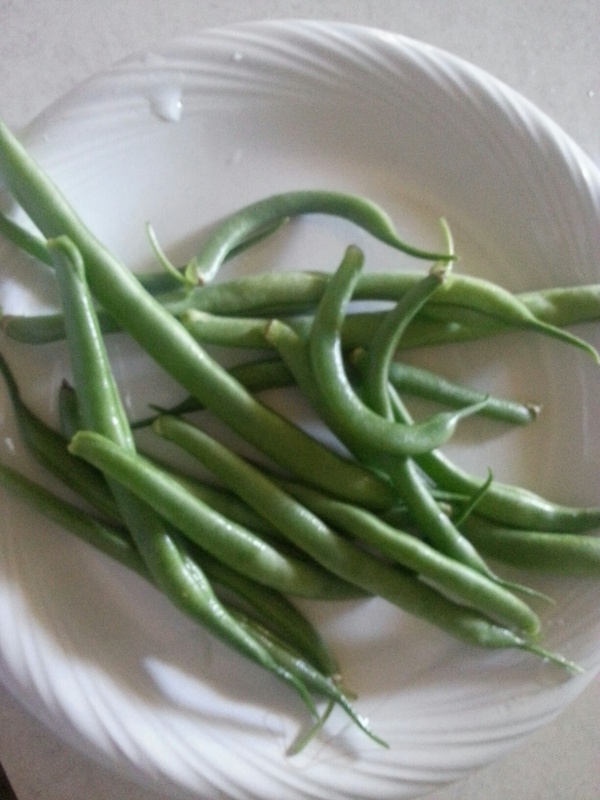 My green beans are abundant, and I pulled my first carrots, gathered some baby cucs, shallots, and squash! The pattipans are especially prolific this year. My apple tree is loaded down (although mine ripen late) and the bees are buzzing happily. Life is good. But how to preserve all that abundance! Pickles! In my favorite home away from home (Italy) they make something called giardiniera….which just means pickled vegetables. The Italians make it a hundred ways, but my favorite is veggies cut into bite size pieces and then pickled in spicy brine. You can virtually use any semi hard raw veggie. 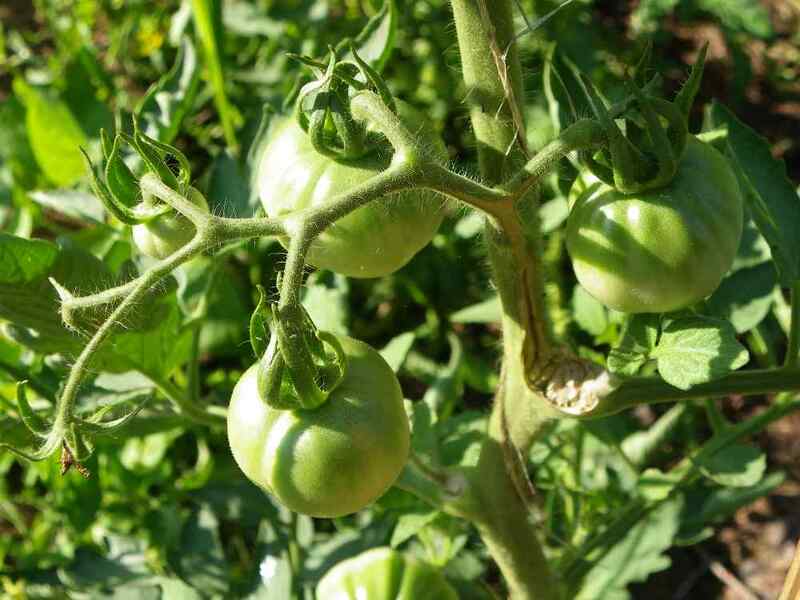 Cauliflower, sweet peppers, zucchini, yellow squash, cucumbers, carrots, onions, celery, hot peppers, fennel, asparagus, radishes, green beans, watermelon rind, green pea pods, green tomatoes, even small red one as long as they are firm….the sky is the limit. This is a no brainer for the kids to make as well because there’s no blanching of veggies, no processing, no special jars. As a matter of fact….old pickle jars work just fine! 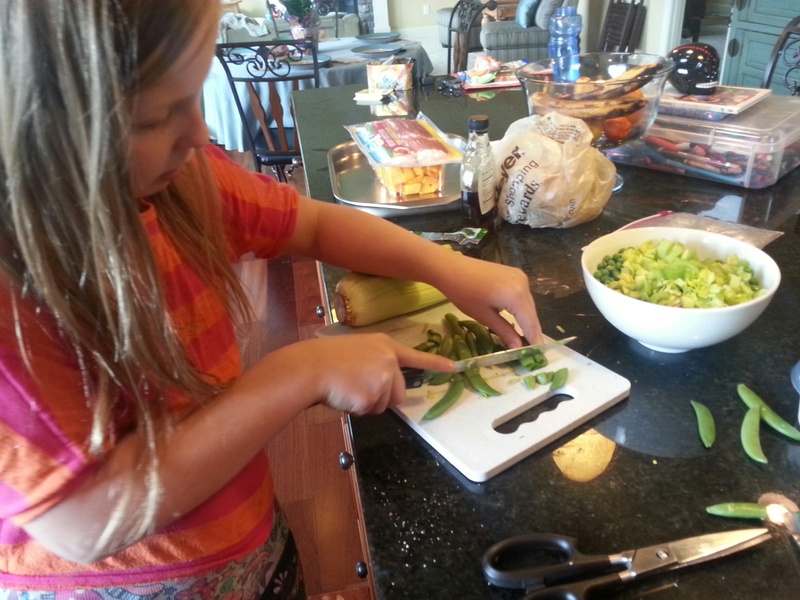 The kids use serrated picnic knives or some special plastic knives I bought for them to chop the veggies. No need to worry if they get big pieces or small….it all works. The brine is simple too and you can make it as spicy (or not) as you like! There are as many ways to make giardiniera as there are Italian Mothers! Here’s an easy version from “In My Kitchen” by Ted Allen. *Or use whatever veggies you like best! In a medium saucepan, bring 4 cups of water to a boil, reduce heat so the water simmers, and add garlic. (Simmering the garlic in water cooks out sulfur compounds that otherwise will cause the cloves to turn a harmless but very unappetizing blue-green color from the acid in the vinegar.) Cook garlic for 5 minutes. Add the vinegar and salt, raise the heat, and bring to a boil, stirring until the salt dissolves. Remove from heat. 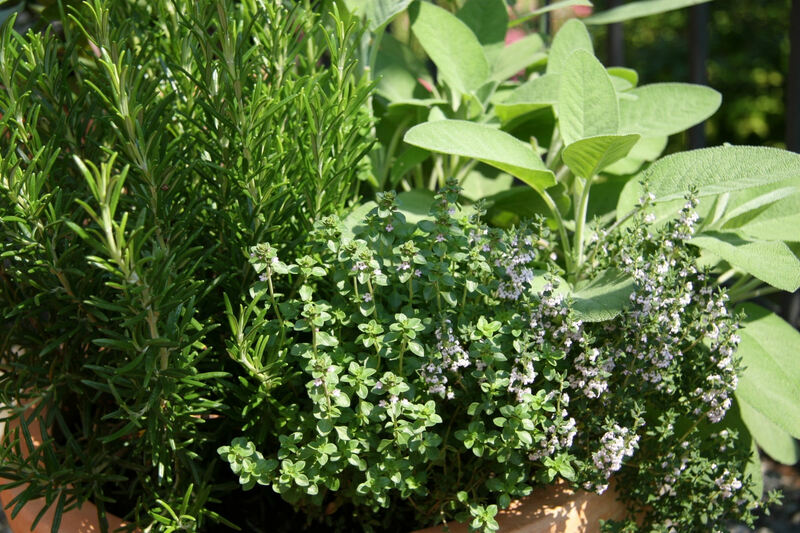 In two sterile 1-quart canning jars, place a few sprigs of dill. Divide the seeds and peppercorns between the jars. Using tongs, remove the garlic from the brine and place 5 cloves in each jar. 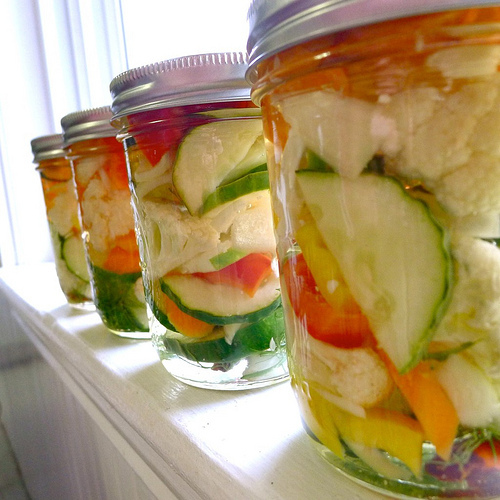 Then pack the jars full of the veggies and chilies (you want them to be tightly stuffed). Bring the brine back to a boil, pour it over vegetables to cover completely, let cool and refrigerate. The pickles will taste good in just a few hours, better after a couple of days. And they’ll keep for about 3 months. Note: Keep the chilies whole for a mild heat, or cut them in half for additional kick. 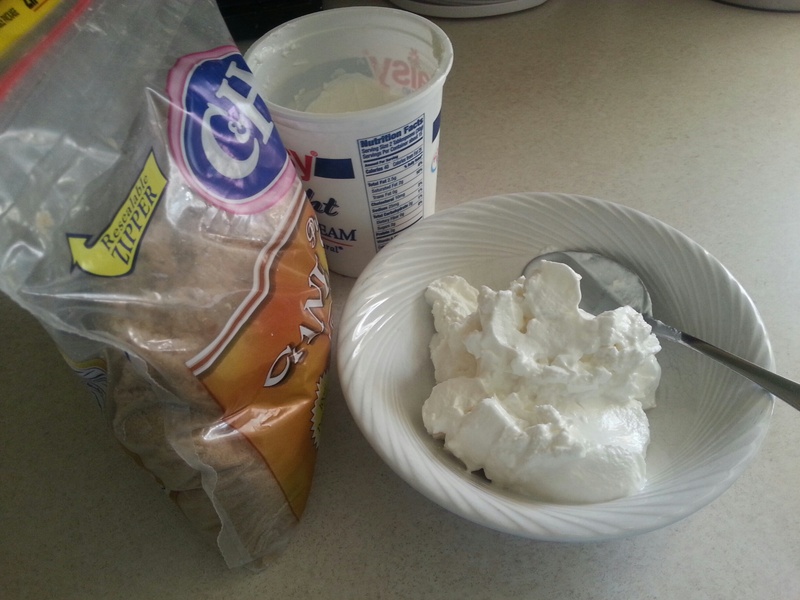 This entry was posted in Uncategorized on July 26, 2013 by cookingwnana. Just back from my beach vacation…boy was it great. 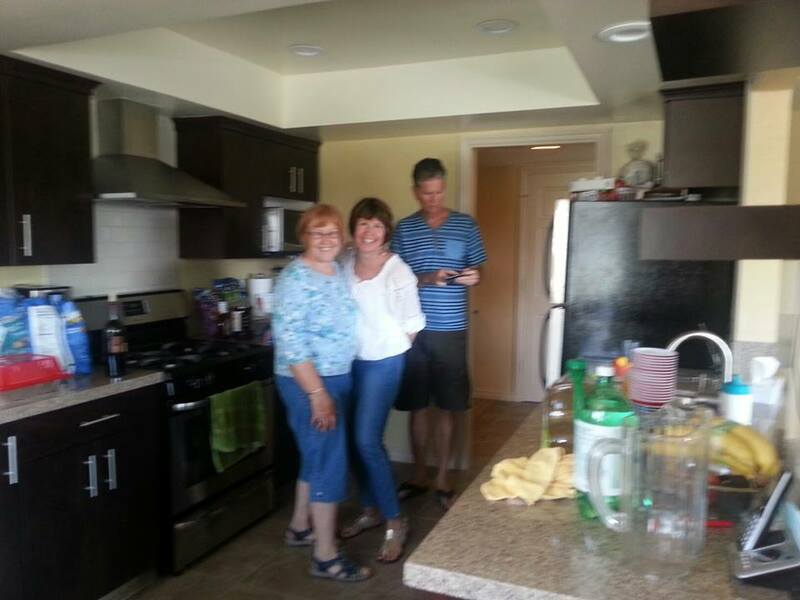 And a great opportunity to enjoy some light, refreshing meals, some new recipes from my “almost family” reunion! 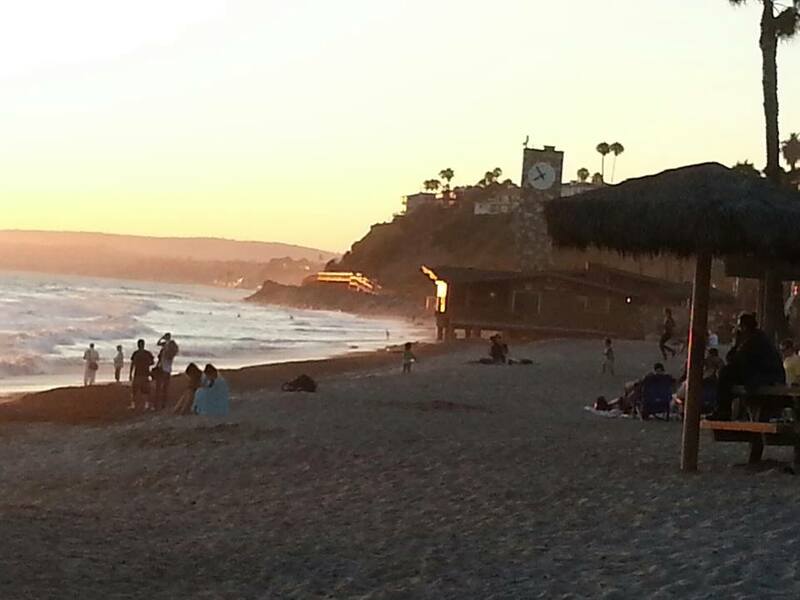 I have a close friend who invites me to her beach time share every summer in San Clemente. 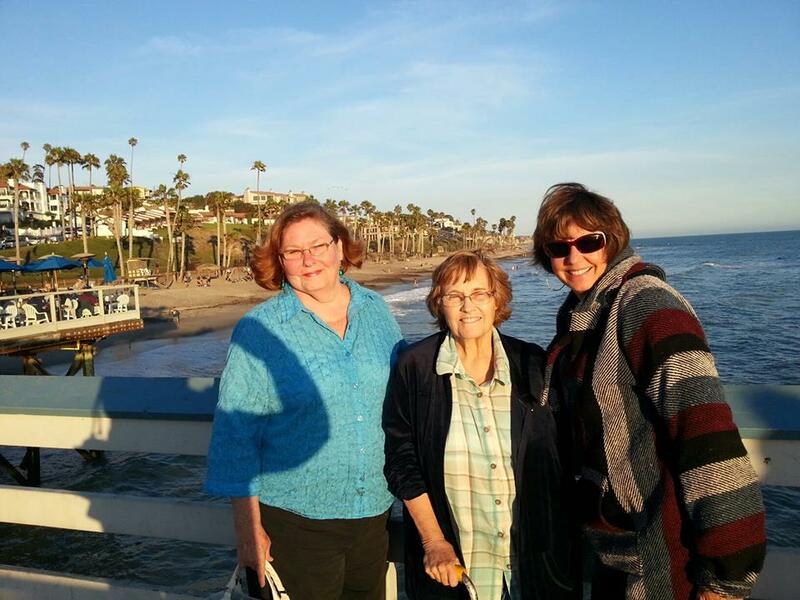 Having lived for many years in San Diego…it is a great way to connect with some old friends nearby and to enjoy the laid back Southern Cali lifestyle for a few weeks! Along with all the sun soaked Vitamin D I absorbed, we enjoyed barbeque on the San Clemente Pier’s famous Oyster Bar at Happy Hour, Giant Shrimp Shooters and Beet/Goat Cheese Salad at the Newport Beach Yacht club, salmon and grilled corn on the cob on our own patio grill, papaya and pineapple smoothies, turkey avocado Panini, watermelon lemonade, peaches to die for from the farmers’ market, strawberry banana frozen yogurt, and a lot of liquid sunshine! Swimming everyday and all that wonderful food was a true taste of luscious summer. This year my friend had asked the members of her family living close by to come over for a big family barbeque at the beach! They came from far and near…two generations of them…all very healthy happy people. They were kind enough to adopt me into their fold! As with many reunions, everyone brought a dish to share, and, frankly, since it wasn’t MY family reunion…I didn’t experience the “same old” recipes. So this was fun on many levels! Several of Lucy’s family live on or near the beach, and many are life long surfers. Healthy, fit, tanned and full of life. 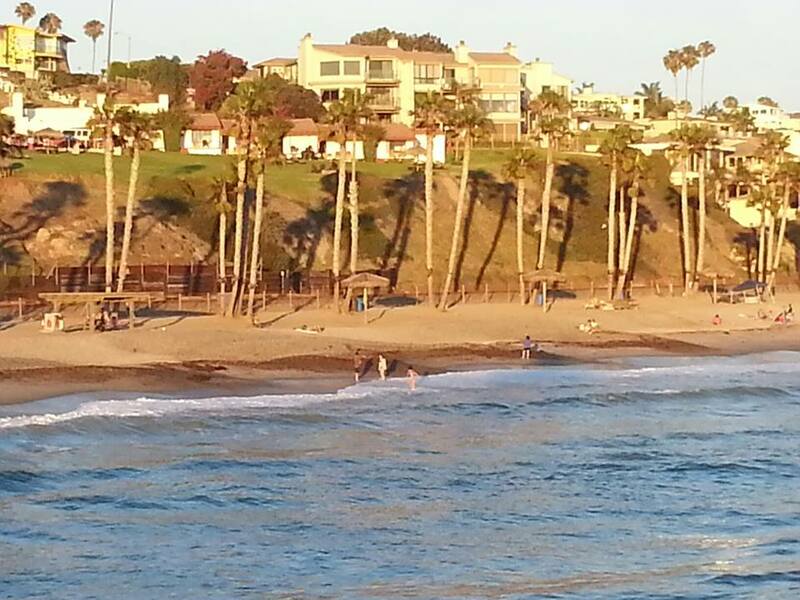 There are several generations of surfers here from ones in their 60s to the youngest in their teens. And they brought with them healthy, mostly vegetarian dishes…except for our own BBQ ribs, and Shrimp on the Barbie. But the ubiquitous summer potato salad, hot dogs, and hamburgers was missing. Instead they brought dishes like cous cous mango salad, black bean and corn salad, Chinese slaw with fresh ginger, lentil and celery salad, and my favorite….banana oatmeal cookies! We were treated to this banana delight from one of the 20 something surfing couples who raved about them. 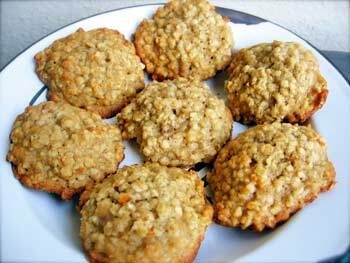 They are simple, delicious, and good for you….yet will fulfill that sweet tooth! I have affectionately named them “surfer cookies” considering their source. So simple, and something that I am definitely planning to make with the grandkids! These cookies could also be made in large batches and frozen. They’re great for breakfast, pack your own lunches, as energy bars, and definitely after surfing!…or just about any time! You only need 3 ingredients! Mash the bananas with a fork (or a food processor), pour in oats and nuts. Stir till well blended. (Add any additions). Scoop (I use a melon baller for small ones) by teaspoons onto cookie sheet. Makes 8 cookies or 16 small ones. 93 calories (for 2 small ones or one regular), fat 3.5 g, carbs 15 g., Protein 2 g, Sodium 0.4 mg. 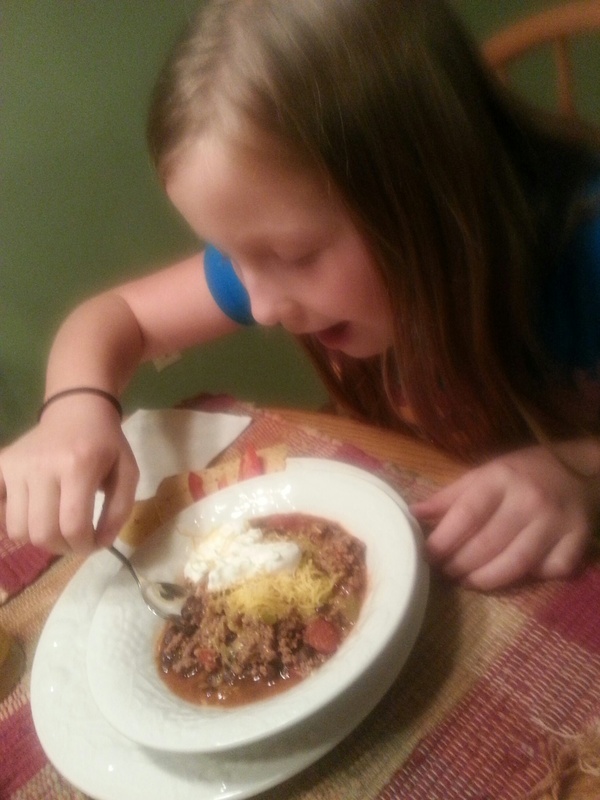 This entry was posted in Food, Grandparenting, Kid Food and tagged Beach Barbeque, comfort food, easy to make, eating healthy food, fellow adventurers, food, fresh food, healthy eating, kid friendly food on July 20, 2013 by cookingwnana. AH….my favorites! Love strawberries, and this time of year I get to combine two things I really love! 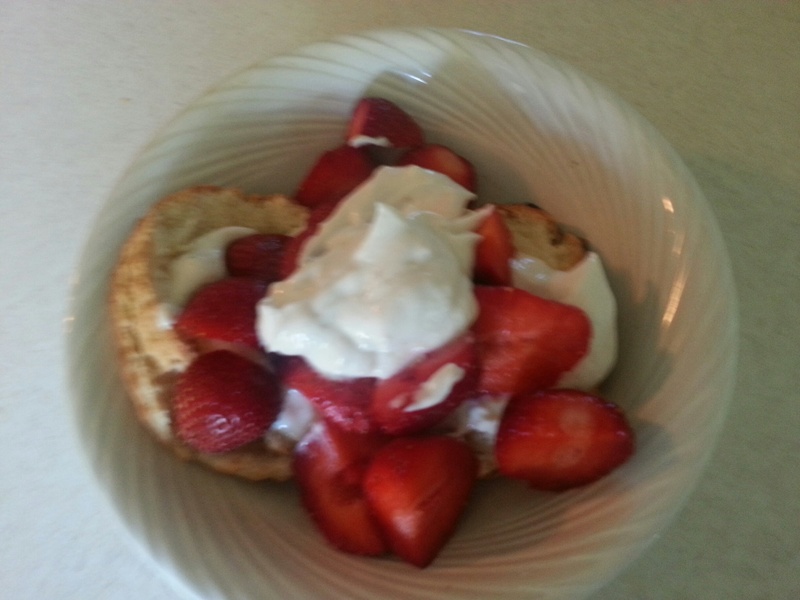 My own granny’s scones (she pronounced them scuns) which are very much like shortcake…and some fresh home-grown strawberries! Yummy! 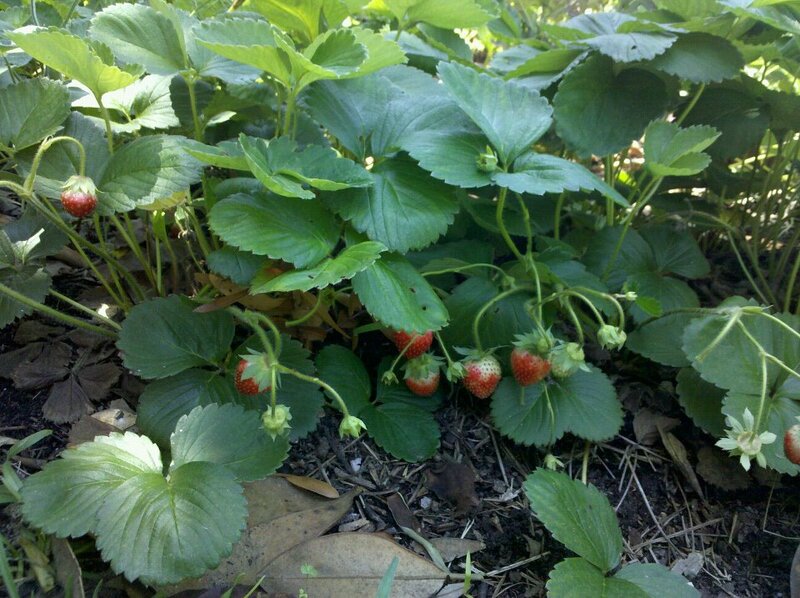 My good friend and neighbor, Lucy, has a prolific strawberry patch, and she has been gathering strawberries for about a month now…and up here in the Pacific NW…they seem especially sweet! Maybe it’s just because she gifts them to me about once a week during strawberry season! What a friend! 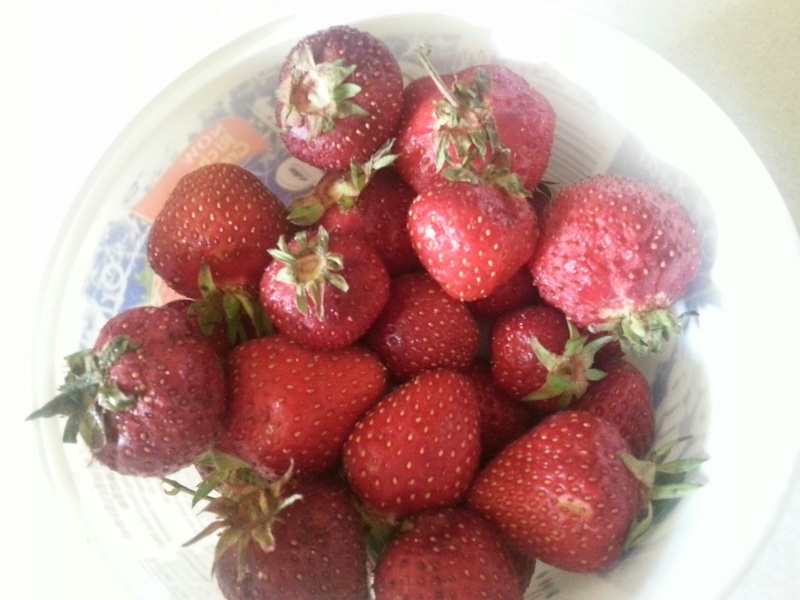 I keep intending to make strawberry jam but they are so good plain and fresh…that I end up eating them all before I get anything made from them. 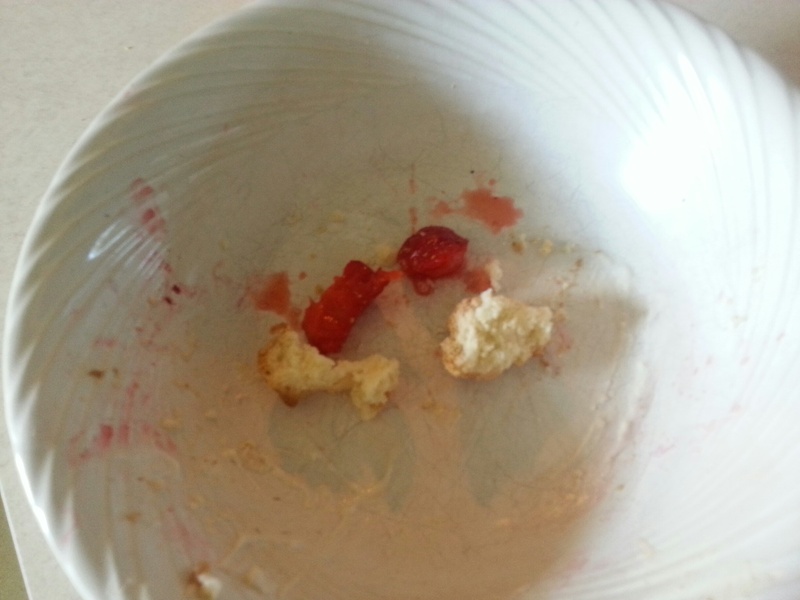 So to have my (short)cake and eat it too….this morning I had scones and strawberries for breakfast! Yummy! 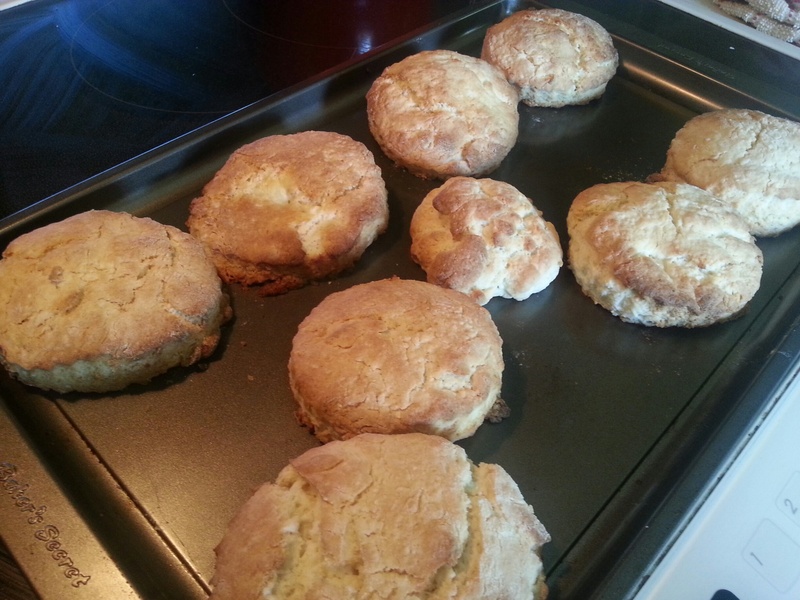 My granny’s scone recipe is pretty simple and I often add different things to it. Sometimes I add nuts or raisins, currants or dried cranberries, some orange or lemon zest, etc….but today I made them just plain so as not to detract from the strawberry lusciousness! I did put a bit of lemon rind in this batch to enhance the scones, but you can also make them plain. Many folk like to cut them up into triangles, and although this is a very traditional shape, I don’t do it for a couple of reasons. First, the corners of the triangles tend to burn before the center is done, and second…I’d rather use my granny’s cutter….it’s an old fluted biscuit cutter that makes just the right size scones for shortcake! I also do a variation on “cream” on top of the scones. Granny used to serve them with strawberries and a tall glass of buttermilk…but that’s getting harder to find in stores these days, but I like the creamy tartness of buttermilk when you can get it. Otherwise I use a dollop of sour cream sweetened with just a hint of brown sugar and that does the trick for me! This entry was posted in Food, Grandparenting, Kid Food, Parenting, Uncategorized and tagged comfort food, Easy to Cook, easy to make, eating healthy food, fresh, home grown, kid friendly food, local food, nutritious, organic, scones, strawberry recipes, whole food on June 17, 2013 by cookingwnana.